Here at New Beginnings K-9 Training, we’ve developed a very strict and successful means to our boarding program. At first, it looks like a lot, but once you take a deeper look into why we do the things we do, most people are put at ease and are happy about what we do for them and their dogs. Early on, we learned we were very different from the other dog boarding facilities in the game, especially here in the Greater Cincinnati and Northern Kentucky area, and that’s what we pride ourselves on. Our approach to dog boarding is focused 110% on the success of your dog by decreasing the amount of stress in a boarding situation. Many people would be surprised to learn the facts and statistics revolving around the world of boarding facilities. Most people will tell you as soon as they enter a facility, they first notice the noise, followed by the smells. The biggest difference we’ve learned through our open tours, is that people are amazed when they walk into a quiet and odor free environment here at NBK9. The next thing we’ve learned, is that our clients were not always told the truth about their dog’s previous boarding situations. There have been a large number of clients that have come to us after a dog has been injured,picked up ill, or returned to be told their dog has passed away during their boarding stay while at another facility. Clients have shared horror stories about previous boarding experiences, which makes us focus on why we’re different, and we’re proud to be this way. Here at New Beginnings K-9 Training, we ask you to prepare for your dog’s stay. We’d love it for you to come by with Buddy, let us give him treats in our parking lot, let us bring him inside the lobby for a snack, or walk him down the hall, then come right back out to Mom or Dad and go home for the night. We do a thorough questionnaire and checklist prior to any reservation to assure we know everything about Buddy, his diet, his habits, and his personality. We LOVE when clients schedule their boarding dates months in advance because this give us time to prepare. This is also very beneficial for those that understand Buddy is a little nervous about boarding, or if Fido has never been boarded before. We go through such a process to help your fur-baby be most comfortable during their stay. 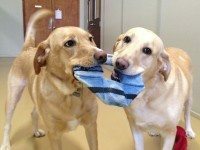 New Beginnings K-9 Training does not have an open door policy when it comes to doggie daycare and dog boarding because we like to prepare, we like to get to know Buddy and Fido, and we want to put you at ease as well. Boarding Buddy or Fido isn’t just stressful for them, it’s also very stressful for you. We put you at ease through your pets stay with our frequent updates. We will call you, e-mail you, and even send you pictures of how much Buddy loves it here. And if Fido isn’t enjoying his stay in doggy daycare or while boarding, we’ll call you for that too so we can devise a plan to make it easier on him. In any emergency, we keep your vet’s contact information and have our own vet on speed dial. We will always make you aware if anything should happen with Buddy or Fido. Our staff is thoroughly trained in canine body language and have had professional veterinary education regarding common injuries and illnesses for all dogs that come into our building. But wait, there’s more! You never have to worry about extra fees to get Fido outside for another potty, no extra feeds for Buddy’s medication, and no extra costs for hugs and treats either! Everything you need for boarding is included in your flat 24-hour stay prices. Oh, and did we mention all boarding dogs will get to play in our closely monitored playgroups? Yep! All boarding dogs are temperament tested with other dogs in their 24-hour test run, this way we know which dogs Buddy should and shouldn’t go with. And if Lucky doesn’t like to play with Fido and his friends, well we have a program for that too! Many facilities in our area have this open door policy for dropping off and picking up your dog for their boarding stay. Well, we’re not them. We want Fido to feel like he’s on vacation too! We want Fido to hop in the car and get even more excited when he gets to the parking lot because he knows that this is where the fun happens. Boarding your dog doesn’t have to be a chore and it doesn’t have to be nerve wrecking for you and Fido. Here at NBK9, you don’t drop your dog off and hope for the best; you drop your dog off and hope your vacation is going to be as fun as theirs. Our staff understands what it’s like not to have a place like this for our own dogs, what it’s like to worry while you’re away, and now we’ve learned what it’s like to feel comfortable while we have to be away. We want all dogs to have a safe, happy, and stress-free boarding stay; that’s why we’re on our own mission to be different.